I flew into Minneapolis last Sunday from Milwaukee to help out The Ticket King office in Minneapolis just in time to see the Packers play the Arizona Cardinals. I was hoping that the packers would win and the cowboys would lose so that the packers would play the Vikings again, but unfortunately that wasn’t the case. The Packer’s game was so close! I couldn't believe my eyes when it came down to one tiny mistake in overtime. Just like that it was all over for the packers. After I picked myself up from the heartbreak of that last play I decided that I needed to focus on the company and help sell Vikings playoff tickets. I had a great time in the office getting to know the other branch of the company and working with Minnesota fans all week! There were so many people who wanted to come see the Vikings play the cowboys for the first time this season in the dome! The Ticket King office in Minneapolis is only two blocks away from the Metrodome, so by the end of the week I was definitely jealous of all of the fans who would be going to the playoff game Sunday! After all of the customers picked up their tickets my boss decided to surprise a few of us with 40 yard line tickets, just twelve rows up behind the Vikings bench. I was beyond exciting! 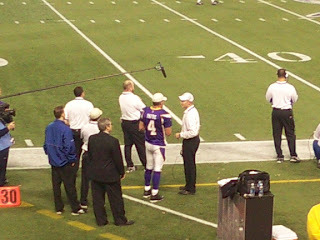 My first game at the dome with such great seats! Although I would have loved it to be the Packers Vs the Vikings, it still was a great game. Always being a Packer fan, the most exciting part of being there was seeing Brett Favre in action up close for the first time! !